For other uses, see Deep Purple (disambiguation). "Deep Purple" was the biggest hit written by pianist Peter DeRose, who broadcast, 1923 to 1939, with May Singhi as "The Sweethearts of the Air" on the NBC radio network. "Deep Purple" was published in 1933 as a piano composition. The following year, Paul Whiteman had it scored for his suave "big band" orchestra that was "making a lady out of jazz" in Whiteman's phrase. "Deep Purple" became so popular in sheet music sales that Mitchell Parish added lyrics in 1938. Larry Clinton and His Orchestra recorded one of the most popular versions of the song on 23 December 1938. Featuring vocalist Bea Wain, the Clinton version was a huge hit. Released in January 1939 on Victor Records, the Clinton recording was number one on the U.S. popular music charts for nine consecutive weeks in 1939. The next most popular version was made by Jimmy Dorsey which reached the No. 2 spot in the charts and other versions by Guy Lombardo (#9), Bing Crosby (recorded March 22, 1939 with Matty Malneck and His Orchestra) (#14) and Artie Shaw (#17) ( with vocalist Helen Forrest) also charted in 1939. The song is a sentimental ballad. The tune was a favorite of Babe Ruth, and Peter DeRose performed the song at Ruth's birthday parties for about a decade. It was Adelaide Hall who introduced the song to Britain and recorded it for Decca. Her version was released on 15 May 1939. The song remained a traditional pop favourite, recast in 1957 as a doo wop classic by The Dominoes with vocals by Eugene Mumford. Screamin' Jay Hawkins (best remembered for his song "I Put A Spell On You") also released his version of "Deep Purple" on his 1958 album, At Home with Screamin' Jay. Harry James recorded a version in 1951 on the album Your Dance Date With Harry James And His Orchestra (Columbia CL 6138). The saxophone player Earl Bostic had an instrumental hit with "Deep Purple" 1953, along with his biggest hit "Flamingo" (both on his 1963 LP The Best Of Earl Bostic). Joe Loss and His Orchestra recorded it on October 15, 1956. It was released on the 78 rpm record HMV POP 107. Pop and jazz recording artist Joni James also covered "Deep Purple" for her 1956 album In the Still of the Night. The song was released in 1959 by Ralph Marterie on the Wing album Marvelous Marterie. Avant-garde jazz keyboardist Sun Ra recorded the song in 1953 with Swing violinist Stuff Smith for their Deep Purple album. An instrumental version of "Deep Purple" was recorded by The Shadows for their 1965 album The Sound of The Shadows. "I've Been Carrying a Torch for You So Long That It Burned a Great Big Hole in My Heart"
The second most popular version, which hit number one on the U.S. pop charts (the 100th song to do so) in November 1963 and also won that year's Grammy Award for Best Rock and Roll Record, was recorded by Nino Tempo & April Stevens (who are brother and sister). It remained in the Top 40 for twelve weeks and was #1 on the Hot 100 the week before John F. Kennedy was assassinated. This version of the song is notable for April Stevens' speaking the lyrics in a low and sweet voice during the second half of the song while her brother sings. According to the Billboard Book of Number One Hits by Fred Bronson, when the duo first recorded the song as a demo, Tempo forgot the words, and Stevens spoke the lyrics to the song to remind him. The record's producers thought Stevens' spoken interludes were "cute" and should be included on the finished product, but according to Stevens, her brother was not as easily convinced: "He didn't want anyone talking while he was singing!" The Nino Tempo/April Stevens version was intended to be the flipside of a song called "I've Been Carrying A Torch For You So Long That It Burned A Great Big Hole In My Heart". However, radio stations preferred "Deep Purple". "I've Been Carrying A Torch..." held the distinction of being the longest title (contains 67 letters and/or numbers) of a flipside of a Billboard number-one record, according to Bronson. The flip of Prince's 1984 #1 hit "When Doves Cry", titled "17 Days (the rain will come down, then U will have 2 choose, if U believe, look 2 the dawn and U shall never lose)", is now the longest titled such flipside, with 85 letters and/or numbers. Singer Carol Sloane has recorded two versions, on her 1962 debut album, Out of the Blue, accompanied by an octet performing Bill Finegan's arrangement, and on her 2001 CD, I Never Went Away, accompanied by pianist Norman Simmons. Al Hirt released a version on his 1965 album, They're Playing Our Song. Another brother-and-sister team, Donny and Marie Osmond, revived "Deep Purple" in 1975 and took it into the Top 20 on the U.S. and Canadian pop charts. It peaked at #14 in March 1976 on the Billboard Hot 100, with Marie intoning the balmy lyrics during the break as April Stevens had done in the version with Nino Tempo. 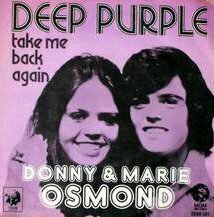 The song that succeeded the Tempo/Stevens version of "Deep Purple" at number one on the Billboard chart, "I'm Leaving It Up To You" by Dale & Grace, had also been a hit over a decade later in a cover version by Donny & Marie (in 1974). Donny and Marie's "Deep Purple" was a yet bigger Adult Contemporary hit. It peaked at number eight on both the U.S. and Canadian charts. The song spent 23 weeks on the pop chart, far longer than any other song by the Osmond family. "Deep Purple" is ranked as the 42nd biggest U.S. hit of 1976. Donny and Marie performed "Deep Purple" on The Bob Hope Show on December 14, 1975. In 1978, the Beach Boys recorded a version for their (still unreleased) album Adult/Child. This recording, along with the rest of the album, has been circulating amongst collectors for many years. Eileen Brennan and Peter Falk sing it in duet in the film The Cheap Detective (1978). A recording by Vic Damone featured in the film Donnie Brasco (1997). Ingrid Lucia sang the song on the album titled Almost Blue (2004). Screamin' Jay Hawkins recorded a version on his debut album At Home With Screamin' Jay Hawkins (1958). The British rock band Deep Purple got their name from Pete De Rose's hit as it was the favourite song of guitarist Ritchie Blackmore's grandmother; she would also play the song on piano. ^ Whitburn, Joel (1986). Joel Whitburn's Pop Memories 1890-1954. Wisconsin, USA: Record Research Inc. p. 491. ISBN 0-89820-083-0. ^ Wilson, John S. (1983-04-15). "From Britain, Adelaide Hall And Her Cabaret Act". NYTimes.com. Retrieved 2016-09-27. ^ Whitburn, Joel (2004). The Billboard Book of Top 40 Hits: Eighth Edition. Record Research. p. 625. ^ "Top 100 Hits of 1963/Top 100 Songs of 1963". Musicoutfitters.com. Retrieved 2016-09-27. ^ "Out of the blue- (Musical CD, 1996)". WorldCat.org. Retrieved 2016-09-27. ^ "I never went away (Musical CD, 2001)". WorldCat.org. Retrieved 2016-09-27. ^ "Al (He's The King) Hirt* - They're Playing Our Song (Vinyl, LP, Album)". Discogs.com. Retrieved 2016-09-27. ^ "Timeline - 1975". Osmondmania.com. Retrieved 2016-09-27. ^ "Timeline - 1976". Osmondmania.com. Retrieved 2016-09-27. ^ "Top 100 Hits of 1976/Top 100 Songs of 1976". Musicoutfitters.com. Retrieved 2016-09-27. ^ "The Bob Hope Show - Season 26, Episode 2: Bob Hope's NBC Christmas Party". TV.com. Retrieved 2016-09-27. ^ Steffen Hung. "Forum - Top 100 End of Year AMR Charts - 1980s (ARIA Charts: Special Occasion Charts)". Australian-charts.com. Archived from the original on 2014-10-06. Retrieved 2016-09-27. ^ a b "Image : RPM Weekly - Library and Archives Canada". Bac-lac.gc.ca. Retrieved 2016-09-27. ^ "Australian Chart Book". Austchartbook.com.au. Archived from the original on 2016-03-05. Retrieved 2016-09-27. ^ "Top Singles – Volume 26, No. 14 & 15, January 08 1977". RPM. Library and Archives Canada. Archived from the original on June 10, 2016. Retrieved March 13, 2016. ^ Jerry Bloom (2006). Black Knight: Ritchie Blackmore. Omnibus Press 2008. Blackmore has stated; "It was a song my grandmother used to play on the piano." "These Foolish Things Remind Me Of You"
"St. Therese of the Roses"